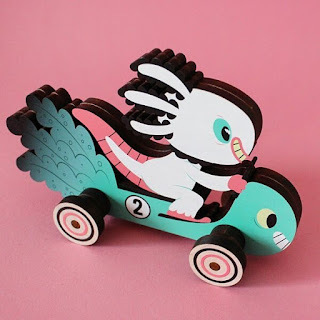 Check out this super cute Wooper Looper #2 Wood Push Car by Ink It Labs and Gary Ham, which will be released exclusively at Designer Con 2017 this weekend! Limited to just 25 pieces, this wood figure can be purchased at the StipplePop DCon booth #421 for $65. Plus, you can get the figure signed by Gary, who will be holding a signing at the booth this Saturday at 2pm.